Spherical Plain Bearing The GE.E Series is a spherical plain bearing with a sliding contact surface that is an inner spherical surface and an outer spherical surface that can be swung at any angle during motion. It is made by surface phosphating, blasting, inserting, spraying and other special processing methods. Spherical Plain Bearing The GE.E Series is a spherical plain bearing with a sliding contact surface that is an inner spherical surface and an outer spherical surface that can be swung at any angle during motion. It is made by surface phosphating, blasting, inserting, spraying and other special processing methods. Spherical Plain Bearing GE.E Series features high load capacity, impact resistance, corrosion resistance, wear resistance, self-aligning, and good lubrication. 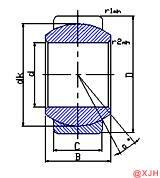 Spherical Plain Bearing GE.E Series can withstand large loads. Depending on their type and construction, it is possible to withstand radial loads, axial loads or combined loads of radial and axial forces. Since the outer surface of the inner ring is provided with a composite material, the bearing can be self-lubricated during operation. Generally used for low-speed oscillating motion, and low-speed rotation, it can also be tilted within a certain angle range. When the support shaft and the shaft housing hole are different, the normal operation can still be performed.